Continuing with the return of The Saucepot’s lunchbox, this week things have gotten a little more fishy. One of the biggest struggles I have is coming up with new ideas for lunches and not getting bored of it by the end of the week. When you’ve bought a load of tortilla wraps, salad and fillers like ham and then by Thursday you really can’t face looking at a wrap ever again, you’re stuck with no choice because you’ve bought just the right amount of ingredients for five days and you have to use them up or they’ll go off and go to waste. I really hate wasting food and avoid this situation as much as humanly possible. The beauty of this week’s lunch is that it’s all made from good store cupboard ingredients. 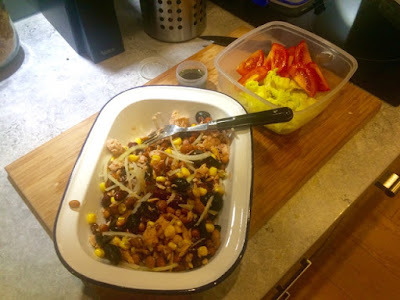 Tuna, sweetcorn, olives and beans are staples in my cupboard. All I had to do was open a can of each, mix it all together, add a little bit of onion and there we have it. 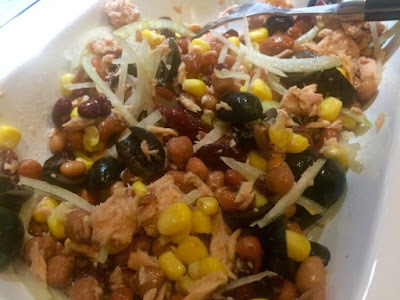 A really great, versatile tuna mix made from store cupboard ingredients that can be used in all sorts of different ways. Here I’ve topped some lettuce and tomato with the tuna mix and added a little pot with extra virgin olive oil and balsamic vinegar to dress it with. This makes a really tasty light lunch, but the tuna mix would also work brilliantly in wraps, rolls and sandwiches or as a topping for a jacket potato, or even with some pasta.